09 January 2019 (Toronto, ON) - Global superstar Billie Eilish has released an original song for the forthcoming ‘Inspired By’ album to the critically acclaimed, two-time Golden Globe®-winning Netflix film, ROMA. The song is out now worldwide via Darkroom/Interscope Records/Universal Music Canada, the country’s leading music company, ahead of the release of a full-length Music Inspired By Roma album via Sony Music Masterworks. Featuring various artists carefully hand-picked by Cuarón himself, every song from the forthcoming album was inspired by specific scenes and sounds from the Esperanto Filmoj and Participant Media produced ROMA, and will see its global release via Sony Music Masterworks. “When I was older I used to be a sailor, but I drowned in a storm,” says Pepe (played by Marco Graf) from the Golden Globe-winning and Academy-Award shortlisted foreign-language film, and provided the inspiration for 17-year-old-Eilish and her brother Finneas to write the song and give it its title. 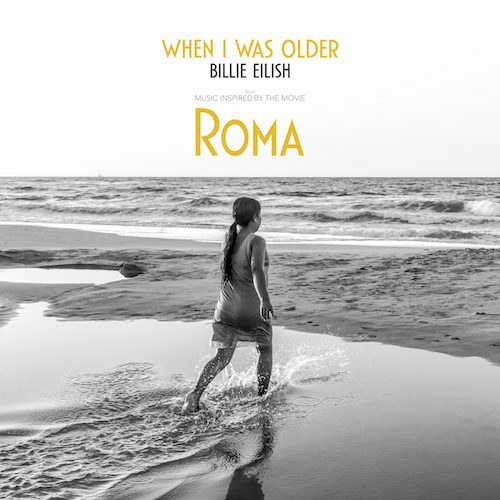 Listen to “WHEN I WAS OLDER (Music Inspired by Roma)” HERE. Seventeen-year-old multi-platinum global pop-phenom Billie Eilish has fast become one of the biggest stars to emerge since the release of her debut single “ocean eyes”. Fast forward from her humble breakout, Billie’s debut EP has since amassed more than 3.5 billion combined streams worldwide. Across seas, Billie is the first international artist to be awarded a BRIT Breakthrough Award for her debut EP in the U.K. and is the youngest artist to ever get listed in the prestigious BBC Radio 1 sound polls. She has consistently sold out headlining tours across the globe and is currently making waves with her latest single “you should see me in a crown” garnering more than a million combined streams in the first 24 hours upon release. Billie Eilish will be hitting the road again as well as releasing her highly anticipated debut album this year, plus making appearances at the recently announced Coachella Festival in April. The most personal project to date from Academy Award®-winning director and writer Alfonso Cuarón (Gravity, Children of Men, Y Tu Mama Tambien), ROMA follows Cleo (Yalitza Aparicio), a young domestic worker for a family in the middle-class neighborhood of Roma in Mexico City. Delivering an artful love letter to the women who raised him, Cuarón draws on his own childhood to create a vivid and emotional portrait of domestic strife and social hierarchy amidst political turmoil of the 1970s. This is Cuarón’s first project since the groundbreaking Gravity in 2013.
dont smile at me EP is OUT NOW.